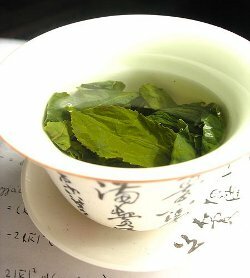 Can anyone identify this type of green tea? My house mate brought back from green tea from either China or Malaysia that was dark green balls that unrolled to large, thick leaves when steeped and I'm struggling to find anything similar! In general, your description - dark green balls which unroll to full tea leaves, sounds like some variety of gunpowder green tea. It is a quite common Chinese technique, as I recall. Each pellet (also sometimes called "pearls") is a rolled and dried tea leaf, which unfurls when steeped. However, it is difficult to get more specific than that without more information. There are several types of green tea that can be rolled into "gunpowder" form, with differing grades of tea, amount of aging, and years or growing locations (given growing conditions) all contributing to somewhat different flavor profiles. You might be able to use the terms and look to see how the information about which varieties of gunpowder green match your house mate's tea or your experiences (or your own preferences) - but without more knowledge I don't know how to pin down the same kind of tea. To answer the question, it would be better if you could also upload a picture of the dry leaves before steeping. Gundpowder tea could be possible, but looking at your image it seems that the edges of the leaves slightly yellowish. This could also point to an Tieguanyin oolong. How to flavour iced green tea? Is Pickwick green tea deceffeinated? Can somebody identify this tea? Why is my green tea yellow? How to identify CTC tea? What is this strange tea?